In the unlikely event that you experience any problems shopping with Kellys DIY please do not hesitate to contact us and we will do our best to help you as soon as possible to resolve any issues or queries to your satisfaction. We will inform you as soon as practicably possible if there are any stock availability problems, pricing amendments or delivery delays to confirm whether or not you wish to proceed. If we cannot get in touch with you within a reasonable time frame we will cancel your order and send an email cancellation to you and instruct the card merchant to process a refund to you. You will be able to check and correct any input errors in your order up until the point at which you submit your order by clicking 'Complete Your Order' on the check-out page. By completing and submitting an order you are agreeing to these Terms & Conditions and making an offer to purchase goods which, if accepted by us, will result in a binding contract. All orders made through Kellys DIY are subject to acceptance by us. We may choose not to accept your order for any reason and will not be liable to you or to anyone else in those circumstances. An order acknowledgment email will be sent to you after submitting an order containing details of the goods that you have ordered and an order number. Please note this email is not an acceptance of your order but merely an acknowledgment of it. Currently stock availability for goods is not available on Kellys DIY. If the item/s are not available we will contact you by phone or email to ascertain if you wish to wait until the goods are available of if you wish to cancel the order in accordance with our returns policy (see below). Unless we have notified you that we have cancelled your order or not accepted it, we accept your order 7 days after the date of order or when the goods are delivered, whichever is the earlier. The total cost of your order is the price of the goods inclusive of any VAT payable (at the applicable rate) plus the delivery and packaging charge as set out in the delivery section below. Payment can be made via PayPal or with Visa Credit, UK visa Debit, Visa Business (Corporate & Purchasing), International Electron, MasterCard Credit including International Maestro, Debit MasterCard, MasterCard Business (Corporate & Purchasing) and Maestro. By submitting an order you are confirming that the credit/debit card that is being used is yours. All credit/debit cards are subject to validation checks and authorisation checks by the card issuer. If your card issuer refuses to authorise payment your order will not be accepted, in such circumstances we will not be liable for non-delivery or any delay and we are not obliged to inform you of the reason for the refusal. If your card issuer or bank charges you as a result of us processing your credit/debit card payment in accordance with your order we will not be responsible for any charge levied. Delivery will generally be by courier although larger items will be by freight. Courier deliveries are insured, tracked and require your signature on arrival. The signature of the person accepting delivery at the delivery address will be proof that the delivery has been received by you or the person to whom the order is addressed, in good condition. All goods will be dispatched to the address provided on the order. If you will not be home to accept delivery of your order please let us know so that we can contact you to make arrangements. Provided the goods you have ordered are in stock we would normally expect to dispatch your delivery within 2 working days of receiving your order. If your goods are not in stock, we would normally expect to dispatch your delivery within 10 working days. If your order is placed during a holiday period such as Christmas then it may be longer but we will do our best to have all goods delivered within 10 working days. Our couriers normally deliver from Monday to Friday between the hours of 9.00am and 5.00pm, but other arrangements can be made, should these times not suit. Please contact us via orders@kellys-diy.com to make alternative arrangements. 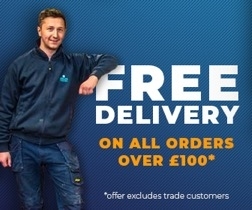 Delivery is available to anywhere in the UK and Ireland and if you have any queries on the delivery charge of your goods, please contact a member of the e-commerce team via orders@kellys-diy.com. Charges to the rest of Europe and International are available upon request, in such circumstances we would ask that you submit your order by email and we will then ascertain the cost of the delivery to your address and contact you with the cost before proceeding. If you see something on our website but would like to see it before ordering then please do not hesitate to come into our shop at Milltown East Industrial Estate, Upper Dromore Road, Warrenpoint, Co. Down, BT34 3PN with the added bonus that you can collect the order free. Kellys DIY want you to be happy with your order. In the unlikely event that you receive goods that are not of satisfactory quality, do not fit the description or are unfit for purpose, you have the right to cancel all or part of your order. The product must be unused and in its original packaging and condition. Orders which are mixed, cut or made to measure to your requirements will not be exchanged or refunded. You will receive a full refund of the price paid (including any relevant delivery charges) less any collection charges. If you return part of an order the delivery charge will be recalculated and you will only be refunded the portion relevant to the item returned. Inform us in writing – by email or letter (not by telephone) that you wish to cancel the order within 7 working days from the day after you receive delivery of the goods. When writing to us please provide us with your contact details, proof of purchase, state the reason(s) for the return or if there is no reason, and whether you would like to arrange a refund, exchange or credit note as appropriate . Return the goods to us within 7 working days of notifying us complete with the original product packaging (if applicable) and a copy of the delivery note to Kellys Point Building Supplies, Milltown East Industrial Estate, Upper Dromore Road, Warrenpoint, Co. Down, BT34 3PN. Please ensure that you take reasonable care of the goods and repackage them for a safe return. You can also ask us to arrange collection of the item/s. Please note that you must pay for the return postage/collection costs, unless the goods are faulty or we delivered them to you in error. If you arrange to return the goods yourself please ensure that you have proof of postage from the Post Office or courier. If goods returned are not in re-saleable condition or the packaging is damaged, we reserve the right to refuse a refund. If you wish to cancel your order prior to delivery Kellys DIY will offer you a full refund as soon as possible and within a maximum of 30 days after the date of cancellation. However, if your order is already in transit you must accept delivery of the goods and return them at your own cost, by following the returns procedure above. If goods are faulty, we may offer a repair, exchange or refund in accordance with your consumer rights – please telephone and ask to speak to an e-commerce customer services assistance on 028 417 73674 to arrange. The telephone line is open Monday to Thursday 7.30am- 5.30pm, Friday 7.30am – 5pm, Saturday 8am-4pm excluding specified closure days such as some bank holidays. We have taken every care in the preparation of the content of this website but cannot guarantee that the information will always be completely up to date and free of mistakes. To the extent permitted by applicable law, Kellys DIY disclaim all warranties whether express or implied, as to the accuracy of the information contained in any of the materials on this website and will accept no liability for any loss or damage as a result of problems with access and we shall not be liable to any person for loss or damage, which may arise from the use of any of the information contained in any of the materials on this website. Certain links in this site may lead to other websites which are not under our control. When you activate any of these you will leave our website and we have no control over and shall accept no responsibility or liability for the material on any website which is not under the control of Kellys DIY. If you correspond or participate in promotions or business dealings with advertisers found on or through our website including payment and delivery of related goods or services and any other Terms, Conditions, warranties or representations, then such dealings are solely between you and such advertisers and you agree therefore that we shall not be responsible or liable for any loss or damage of any sort incurred as the result of any such dealings or the presence of advertisers on the website. All brand names, product and service names and titles and copyrights used in this website are trademarks, trade names, service marks or copyrights of their respective holders. No permission is given by Kellys DIY for their use by any person other than the said holders and such use may constitute an infringement of the holders’ rights. All designs, text, graphics and their selection and arrangement on this website are the copyright of Kellys DIY operated by Kellys DIY or its content providers. Permission is granted to users to electronically copy or print portions of the website for their own personal, non-commercial use. Any other use of materials on this site without Kellys DIY written consent is strictly prohibited. Working with Realex secure payment processors or PayPal, we validate your order and credit or debit card details you submit to us before your order can be accepted. Once that has been done we will acknowledge that your order has been received by sending an e-mail to the e-mail address you provide in your registration form. Your order is then subject to further validation checks we may choose to make. If your order passes our validation checks we will send you an order confirmation e-mail, this is our acceptance of your order and it brings into existence a legally binding agreement between us. Kellys DIY reserves the right to restrict the number of items available for sale to any individual customer and all orders are subject to availability. If your offer cannot be fulfilled you may be offered an alternative or given a full refund. We accept payment by most major credit or debit cards. Payment will be subject to validation checks and authorisation by our payment processors; currently Realex or PayPal. We may submit your order to a fraud service checker who will securely review orders on behalf of Kellys DIY. We may also submit your address, date of birth and value of your order to Experian Ltd. We will not be responsible for any delays of your order that this may cause. This information may be retained by Experian Ltd for future validation enquiries by other companies – for more details visit www.experian.co.uk . If the issuer of your payment card refuses to authorise payment we will not be liable for any delay or non-delivery. Currently bulky items orders can only be delivered to Northern Ireland and Republic of Ireland, we can deliver some smaller items to mainland UK. Payment will be debited from your account before the dispatch of your purchase. Kellys DIY have made every effort to reproduce colours as accurately as possible, however different computers produce colours in different ways, and colours may therefore vary from what you see on screen. All prices on Kellys DIY are quoted inclusive of any VAT payable (at the applicable rate) but exclude delivery and packaging charges. On occasion, the price payable in respect of goods advertised on Kellys DIY may differ from those prices payable in the shop. We are under no obligation to honour any in-shop prices in the event that they differ from those on Kellys DIY. Similarly, Kellys shop is under no obligation to honour any Kellys DIY prices in the event that they differ from those in-store. Promotions and prices you see in our store do not apply to our web-site and vice-versa. We endeavour to ensure that pricing on Kellys DIY is accurate, however occasionally an error may occur and would advise that we are not obliged to sell goods at the incorrect price. If we discover a pricing error, we will at our sole discretion either contact you and ask you if you wish to proceed with the order at the correct price or will notify you that we have cancelled your order. Prices that are reduced for special offers and sales are only valid for the specified period. We reserve the right to amend prices, offers, goods and specifications of goods on Kellys DIY at our sole discretion (but not after – (save for incorrect prices as referred to above)) we accept your order.